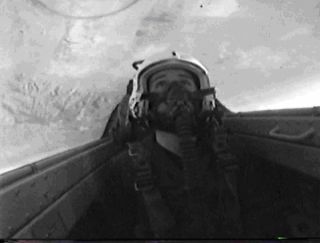 A cockpit camera captures Justin’s ‘inside loop’ over the Mojave Desert. While writing thispiece I'm watching the TV game show "Street Smarts." A teenage contestant isasked: "What vehicle has an ejection seat?" The contestant answers: "a Mercedes-Benz." As a space educator inLos Angeles, I'mnot too surprised at the answer. Since space and technology are courses notcovered in schools to any extent, young people are usually ignorant or blaseabout the subjects. That is, except back in 2003. The usually flat-lineof space interest suddenly spiked in 2003 when Lance Bass announced hisintention to go into orbit and kids who only talked about music were talkingabout space tourism. Dr. Maureen Clemmons and I sought to exploit this flash ofinterest before it fizzled out forever. We quickly found a local 16 year-oldwho wanted to be the First Teenager in Space. By age 17, Eagle ScoutJustin Houchin of Sunland, CA would become the youngest person ever tofly a military jet at the prestigious National Test Pilot School in Mojave Ca.He became the subject of national magazines like Popular Science (Feb., 2004)and Boys Life (May, 2004) and Current Science. Today, Justin at 18gives speeches to raise money for flying lessons and to go to Russia forcosmonaut training. We're hoping that Justin can do some training at NASA's Johnson Space Centerand that young people will follow his progress and become inspired to learnmore about the process. Inspiring young people to think about space is why Icreated the Traveling Space Museum (TSM). The TSM brings full-scalesimulators into schools. On Space Day, the Traveling Space Museum becomes a spacemuseum on wheels--trucking in ten or more attractions directly to the studentsfor the entire school day. Having a background in theater, I knew that propsare effective at keeping kids focused. What I didn't know, when I started backin 1998, is that a rented Mercury spacecraft mock-up in a schoolyard would besuch a thrilling experience for the students--and for me. It inspired me todesign simulators like theOdyssey III Mobile SpaceLab that have responsive switches and kidfriendly hardware like lap top computers and, DVD players. It even has an ECGheart monitor. The hydraulically actuated Orion CRV is the only flight simulator that'sbrought to schools for kids to 'fly.' Students liken the 'sims'to theme park attractions but, more importantly, they grasp the relevancy ofwhat they are doing. . Whether it's Space Day, aSpace & Aviation Expo (which feature free airplane rides) or an AfterSchool Space Academy program, students remember what they learn. We knowbecause they go home and share their new knowledge with friends and family. TSM makes a special effort to reach young students oftenignored by curriculum specialists who believe that grade school students won't 'get it.' I believe that thisis a major mistake. With so manystudents planning to become professional athletes or winning the lottery,steering them early toward careers in aerospace andtechnology will actually save their lives! We also believe that there is no wasted knowledge and we've proven thatyounger students do get it! TSM is planning a 60,000 square foot InteractiveAerospace LearningCenter at Whiteman Airportin Pacoima Ca. designed to inspire an entire community of young people. Another spike in interest could happen any day now. For the sake of thechildren let us pray.